Will you help create a world without T1D? In year’s past, our fundraising efforts commenced with a story about the hardships of living life with T1D – you know, a tug at your heart-strings effort at getting you to donate. This year, it’s a message of progress and hope that drives us. Please indulge and read on. What is the progress and why do we have hope? First – because of you, and your historic support, Team Kasper has raised $279,672 for the JDRF Ride to Cure Program since we started pedaling in 2011.That is absolutely amazing and we could not have done it without your help! Thank you for every penny that you’ve donated. We started the season only $20,328 shy of the $300,000 mark, we thought we’d make that our goal this year…then we realized that would be the lowest total we’ve raised since 2011, so we doubled it!! Please help us get to $40,656!!! Second – as we reflect on that enormous amount of money that y’all have helped us raise, it turns attention to the difference that it has already made. So, please let me highlight at least one thing so that you have an idea of how your dollars have made a huge difference in the lives of my kids and others living with T1D. This year, Jake started using a new pump with new technology. It’s called the Tandem T-Slim X2 Basal IQ. While Tandem is a private company, it’s important to note that JDRF’s efforts at working with regulators to remove barriers to progress, along with JDRF funding of research on the technology that allows continuous glucose monitors to “talk” with insulin pumps is directly responsible for this amazing new device. Now, when Jake’s blood sugar begins to get low, his pump automatically suspends insulin delivery and will not resume until it trends toward normal. Below is an example of an over-night where the pump controlled Jake’s blood sugar, and we all slept through the night uninterrupted and safe!! That technology, the peace-of-mind it provides, changes the game of living with T1D. It is truly life-saving and would not be possible without the focus that JDRF has been able to leverage in this area. That said, there is much more that needs to be accomplished. This is technology Band-Aid to a biological problem, and until scientists are able to solve the autoimmune response that causes T1D, people like Jake, Matthew, Bunny, Anne, and Zachary will continue to be diagnosed and will continue to suffer the complications that come along with T1D. To be honest, just last month another cousin from our family was diagnosed and we need to make this stop!! So – Please help by making a donation today. Please click the link and give so that others may someday live a healthy life without fear and without complications! Please help Team Kasper created a world without Type One Diabetes, because we won’t stop pedaling until we get there! Thank you! 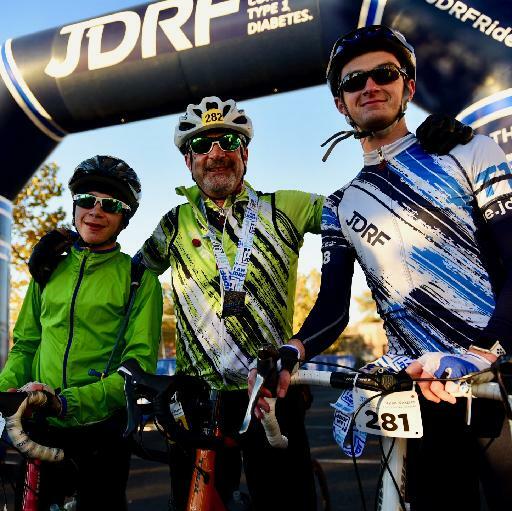 I am proud to be returning for my 4th JDRF Ride!